Home > Light Duty V Belts > FHP V Belts. 2L through 5L Sections... > 4L Light Duty V-Belts (FHP) 4L Sections - CLICK HERE! > 4L320 FHP V-Belt. Consumer Brand. > A30-KC Ultrapower V Belt. Kevlar A30 V-Belt. 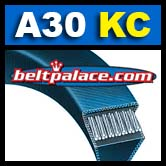 A30 BANDO ULTRAPOWER AG Belt. Kevlar A30 Industrial V-Belt. A Section = 1/2” Wide, 32” Length OC (813mm). Features superior “clutching” Kevlar/Aramid fiber cover for high durability and extra long service life. Heat and oil resistant. Frigidaire 134511600 V Belt for Washer. Fits models: Crosley CLCE500FW0, Crosley CLCE500FW1, Crosley CLCE500FW2, Frigidaire CLCE500FW2, Crosley CLCG500FW0, Crosley CLCG500FW1, Frigidaire CLCG500FW3.